The endocrine system consists of ductless glands that secrete hormones into the blood stream. These hormones drive the homeostatic feedback loops that keep the body healthy and in equilibrium. The endocrine system is intimately integrated into physiological processes in order for it to carry out its functions. The major endocrine glands in humans are the pituitary gland, pineal gland, ovaries, testes, pancreas, thyroid, parathyroid, and the adrenals. The hypothalamus-pituitary complex in the brain is the main neural control center for all endocrine glands and systems. Several organs in the body have secondary endocrine functions such as the heart, gonads, bones, kidneys, and liver. In addition to their homeostatic functions, hormones coordinate growth, reproduction and many other processes. This control center in the brain secretes hormones that have direct effects on tissues and also secretes hormones that regulate the production and secretion of hormones in other glands. Also, this is the main area where the chemical messages of the endocrine and nervous systems are coordinated. In other words, there are many examples where a stimulus from the nervous system is routed through the complex and “translated” before hormones are secreted in response. Dopamine – Modulates motor-control centers (loss of dopamine results in Parkinson’s disease). Somatostatin – Inhibits the release of growth hormone and thyroid-stimulating hormone. Corticotropin-releasing hormone – Causes the release of adrenocorticotropic hormone from the pituitary gland in response to stress, which stimulates the release of cortisol. Thyrotropin-releasing hormone – Causes release of thyrotropin hormone from the pituitary which stimulates the thyroid to release thyroxine and triiodothyronine, affecting metabolism all over the body. Thyroid stimulating hormone – Stimulates the thyroid gland to release thyroid hormone. Antidiuretic hormone – Causes water to be reabsorbed by the kidneys. Oxytocin – Causes contractions of the uterus during childbirth. Melanocyte-stimulating hormone – Stimulates melanin formation in melanocyte cells. 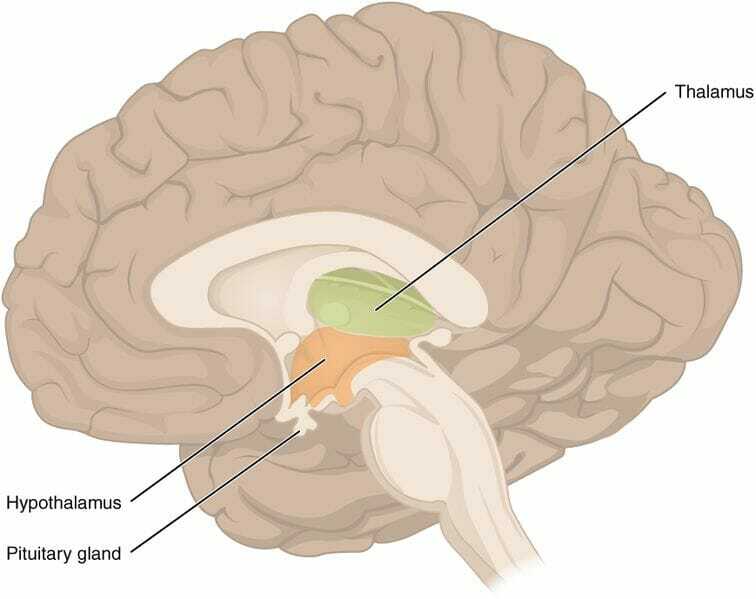 The image above shows the locations of the hypothalamus and pituitary glands in the human brain. Positive and negative feedback loops are essential for homeostasis in the human body. They provide the controls needed to keep the effects of hormones and hormone chain reactions from spiraling out of control. Negative feedback loops act to reverse changes in the body’s physiological condition. For example, cells in the pancreas detect a rise in blood glucose levels. This stimulus causes beta cells in the pancreas to release insulin which causes muscles, fat cells, and liver cells to take in the glucose. The negative feedback begins when blood glucose decreases. Alpha cells in the pancreas then inhibit the release of insulin from beta cells. This is a dynamic process that goes on all the time to maintain homeostasis of blood glucose levels. A positive feedback loop like full-term childbirth intensifies the change in the body’s physiological condition and is considered normal as long as there is an endpoint. In childbirth, the cervix stretches as the baby moves down the birth canal. Stretch receptors in the cervical tissue send messages to the brain which triggers the release of oxytocin. Oxytocin makes the mother’s contractions stronger, stretching the cervix more and pushing the baby farther down the birth canal. This cycle continues until the baby is born and stimulation of the stretch receptors in the cervix stops sending signals to the mother’s brain.